In 2017 ATD Fourth World invited people around the world to document real-life “Stories of Change” starting from situations of injustice and exclusion caused by extreme poverty. These stories, from activists, community leaders, and others, show that when people work together, real change can happen. Dramane left his family and his village when he was only a child, and his departure weakened his family’s position in the community. Now, little by little, Dramane is restoring his ties with the past, and his family is re-establishing their place in the village. Every Wednesday I would go with Yacouba, a Burkanibé member of the ATD Fourth World Volunteer Corps, to facilitate the “Library Under the Streetlights” project in Ouagadougou, Burkina Faso. Each week for some months there, we would meet Dramane, a 13-year-old boy living in the streets. Dramane not only participated in the project, but he also began to respond to the friendship we offered. He often came to see us at the Courtyard of a Hundred Trades, where for over thirty years isolated children, young people, and adults came to learn, share their knowledge, cultivate their strength, and dare to hope that they could overcome their poverty. Dramane had embarked on a new phase in his life. We invited him to join in a masonry workshop at the Courtyard. He wouldn’t earn a lot of money, we told him, but he would have the opportunity to achieve something alongside other people, something he could be proud of. Together with a group of young people, we laughed, sweated, and encouraged one another, and finally managed to straighten the mud walls of one of the Courtyard buildings. “I’m a builder, just like my father”, Dramane told us proudly. We had become friends. In Burkina Faso, there is a proverb that says, ‘You can’t be someone’s friend without also knowing his family’. When we spoke with Dramane about our experiences together in the workshop and about our friendship for him, we told him that we would like to meet his family to tell them about the workshop of which he was so proud. Dramane in turn told us of his wish to learn to sew, and soon afterwards he started a course at a training centre to study tailoring. Meanwhile Yacouba and I began making regular visits to Dramane’s family, who lived some distance from Ouagadougou. Each visit gave us the opportunity to learn about one another, to show photos of Dramane in his training centre, and above all to get advice about Dramane and his future. After more than a year and many visits, Dramane’s father explained that he lived with his family outside the village because he had been held responsible for Dramane’s departure. He was suspected of selling him, and many people in the village still doubted that Dramane was alive. Dramane, for his part, hadn’t been able to find his place within the group of children at the training centre. He fought and then ran away to hide his shame. When we suggested that he come with us to meet his family, he was full of smiles and quick to agree. After many years of separation, it was an intense, emotional time when Dramane returned to his family. In the next rainy season, Dramane returned to the village to help his family with the crops. 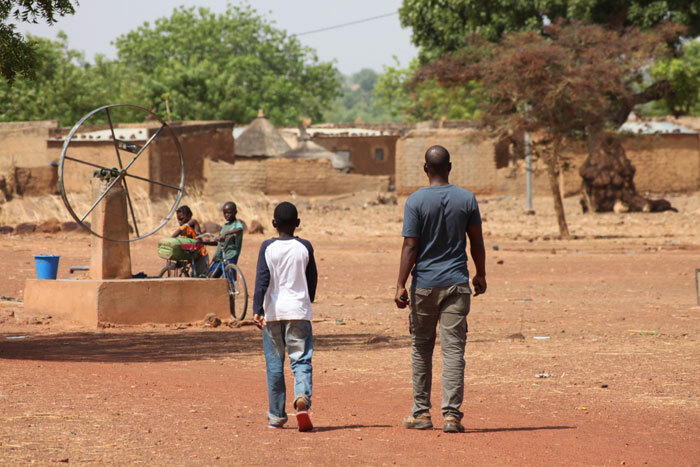 In the dry season, he came back to Ouagadougou, but as soon as the rains started, he went back home again to support his family. Taking his father’s advice, he went to Mali for a year to work with an uncle who had a small business. Dramane is 17 years old now, and is planning to get married and to start his own family back in his village.